Ni Ni (倪妮) and Angelababy (楊穎) attended Christian Dior Spring/Summer 2014 fashion show held during Paris Fashion Week at Musee Rodin in Paris, France on September 27, 2013. 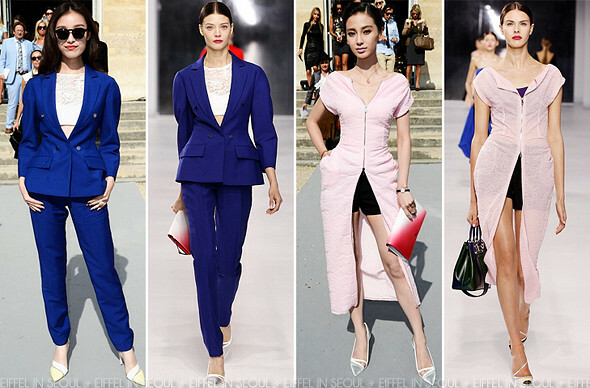 Chinese actress, Ni Ni (倪妮) wore a cobalt blue suit with a white knitted bra from Christian Dior Resort 2014 collection. A pair of black sunglasses and yellow-white pumps from the collection to accessorize her look. It's a refreshing change to see Ni Ni (倪妮) in a suit, I don't think we have seen her wearing pants even. She looks great in cobalt blue but would prefer to a blouse instead of the same bra seen on the runway. Hong Kong actress, Angelababy (楊穎) opted for a pink knitted dress with black shorts from Christian Dior Resort 2014 collection. A pair of white pumps, ombre clutch and baby pink lips to complete her look. I cringed when I saw what Angelababy (楊穎) was wearing. The look just looks cheap on her but then again, I didn't like the look on the runway either.